Suffering with bursitis due to your work conditions? If you have suffered from bursitis and believe that your condition was caused by the negligence of your employer, you could be entitled to work accident compensation. Our team of specialist personal injury lawyers have helped thousands of people throughout the UK make successful claims for compensation for a wide range of injuries and illnesses, including bursitis. To find out if you have a valid claim, contact our solicitors today for a free case assessment. This consultation is free and provided to you with no obligation to proceed. It gives our experts the opportunity to discuss the details of your case to determine if you may be eligible to pursue a personal injury claim. It is also a chance for you to ask any questions you may have, and receive some free legal advice. If you are eligible to make a claim, our solicitors will be happy to take your case on a no win no fee basis. This means that making your bursitis compensation claim will never leave you out of pocket, even if your case is lost. Bursitis is a condition that affects a bursa, which is a fluid-filled sac under the skin that creates a cushion between bones and tendons. The bursa affected by bursitis is usually over joints, such as elbows, shoulders, knees, ankles and hips. The painful condition is caused when the bursa swells and becomes inflamed. The reason why a bursa becomes inflamed is usually through repetitive movement or injury. The condition is commonly suffered by people that take part in sports, with running activities often causing bursitis in the knees and ankles. Even playing darts or snooker on a regular basis can result in bursitis in the wrist and elbow. Gardeners and carpet fitters, for example, will spend large periods of time kneeling. If knee pads or other suitable protective equipment is not used while performing these tasks, a lot of pressure can be placed on the knees. Over time, this can result in the pain, swelling and tenderness associated with bursitis. There are several alternative names for the condition which have developed throughout various industries and are reflective of the areas of the body most affected. Examples include tennis elbow, beat knee, bricklayer’s shoulder and miner’s elbow. Further information about the condition, symptoms and treatment can be found on the NHS Bursitis information page. Am I eligible to make a bursitis compensation claim? 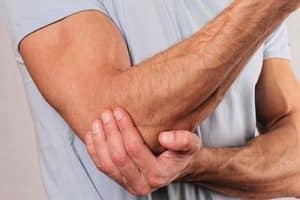 If you have suffered from bursitis as a result of your job or demands from your employer, you may be eligible to make a claim for compensation. To make a valid claim, it would need to be proven that your employer was at fault for causing your injury. Under the Health and Safety at Work Act 1974, all employers have a duty of care to provide their employees with a safe environment to work in. This duty of care includes conducting risk assessments to highlight potential hazards in the workplace and taking all reasonable steps to remove or minimise the impact of these hazards. Steps that should be taken by an employer to prevent the risk of their employees developing bursitis include providing personal protective equipment (PPE) and providing training to carry out work duties in a safe manner. If your employer has failed to take these steps and you have developed bursitis, you should be entitled to receive compensation for your injuries and any financial losses sustained as a result. Our experienced solicitors will work closely with you to obtain relevant evidence to support your case. This will include arranging for you to be seen by an independent medical expert to diagnose and assess the impact of your injury. How much compensation will I receive for bursitis? The amount of compensation that you receive will be based on several factors specific to your case. Firstly the award will take into account the severity of your injury and the impact it has had on your life. For example, has the injury prevented you from doing things that you would normally do, and how long is the injury likely to last? This part of the compensation is referred to as general damages. The second part of the award is called special damages, and this compensates you for any financial losses you have faced as a result of your bursitis. The largest financial impact is often loss of wages if you have had to take time off work. These losses can be recovered by your solicitor, as well as any future loss of earnings if your injury will prevent you from working longer term. Other expenses that you can claim for include the cost of any medical treatment such as physiotherapy and transport costs to and from medical appointments. We offer clients the opportunity to discuss the details of their case, the processes involved in making a claim and the likely compensation award that they will be offered in a no-obligation consultation that is free of charge. This is the prime time to discuss your personal case fully and recognise the benefits of using our highly experienced firm to assist you in achieving the compensation that you rightly deserve. Can my employer penalise me for making a claim against them? All UK employers have a legal duty of care to protect their staff from hazards and risks that can result in an injury, illness or loss. Part of this duty of care is to provide ample training, safety measures and risk assessments of the workplace with a view to protecting employees. If you have been diagnosed with bursitis because of the job that you do or an oversight in your employer’s responsibility for your health and safety, you are legally entitled to make a claim for compensation. It is unlawful for your employer to penalise you for claiming compensation following an accident, injury or loss caused by them. Your employer must not let your claim impact on your working relationship and they would be breaking the law if they broke the terms of your employment contract through being hostile towards you, encouraging you to leave, terminating your employment or trying to dissuade you from continuing with a claim. Rather, many employers see a claim against them as an opportunity to address vulnerabilities with their health and safety planning and management. Following a personal injury claim, many workplaces become safer as companies take steps to prevent similar accidents or injuries occurring in the future. Do you offer a no win, no fee service? Our solicitors acknowledge that one of the most common barriers to clients claiming the compensation that they rightly deserve is the cost of legal fees. We also believe that it is unreasonable for clients to be at a financial loss in the pursuit of justice. With that in mind, we are pleased to offer a No Win, No Fee service. This means that you will not be asked to pay any upfront costs to start your bursitis claim, and there is no financial risk. If we cannot win your case, you won’t pay a penny.